2012 was the lowest minimum sea ice according to most sea ice extent charts. DMI is now showing 2016 crossing to be higher than 2012. JAXA doesn’t show this yet. 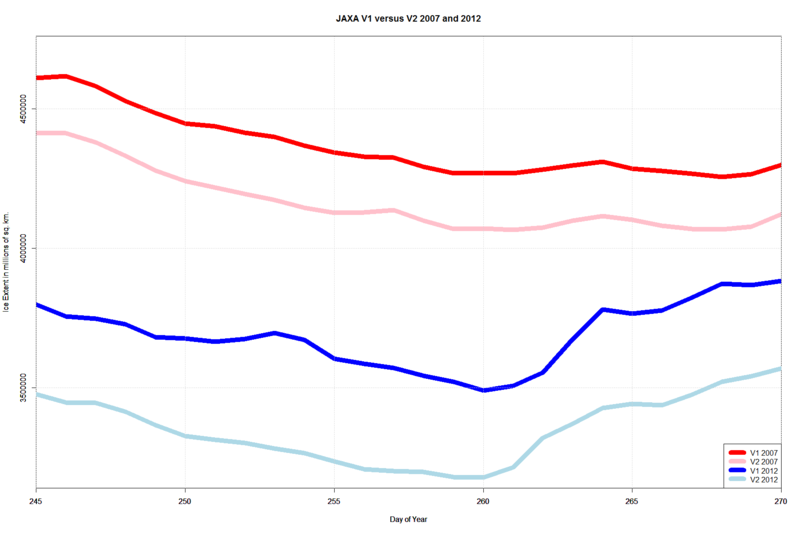 Yesterday I posted all the JAXA V2 versus V1 graphs. I was in a rush and I didn’t set the axis to be identical. Jaxa Version 2 – Increased Difference Between 2007 and 2012 by 200,000 sq km. Yesterday I graphed the difference between JAXA version 1 and version 2 here and here. So I graphed the difference between the 2007 minimum (2nd lowest) and the 2012 minimum (lowest). Guess what? JAXA V2 increased the difference between 2007 and 2012 by 200,000 sq km. V2 dropped 2007 by 200,000 sq km. V2 dropped 2012 by 400,000 sq km. Red/pink are from 2007. V1 is red. V2 is pink. Blue/lightblue are 2012. V1 is blue. V2 is lightblue. UPDATE: Graphs with identical axis here. Earlier today I noted that JAXA version 2 is out and I certainly didn’t like the new revision. Here are all the years/decades compared. Remember the 1980’s, 1990’s and 2000’s are averages for the whole decade. And 2002 is incomplete and starts in June. And 2013 is incomplete because the year isn’t over. I don’t understand how the 1980s / 1990s / 2000s “red” adjustment is so small compared to 2013 etc. UPDATE: All the graphs are here. 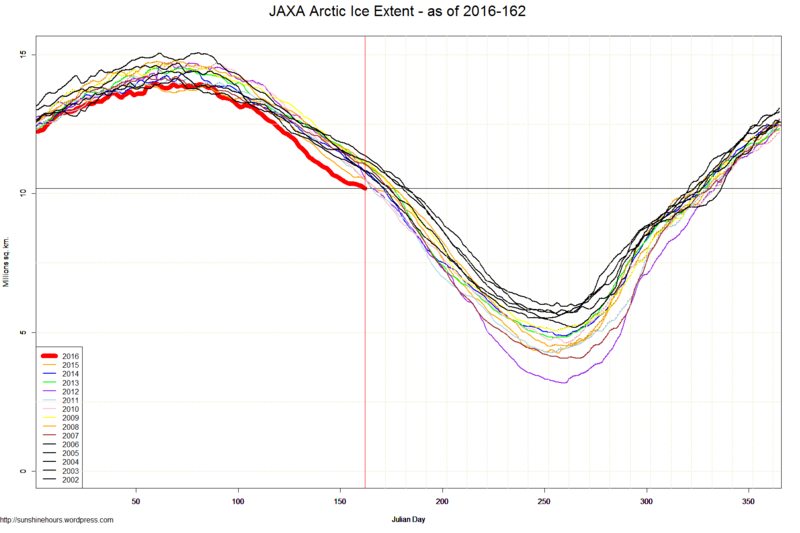 Jaxa is one of the other sea ice monitoring agencies. They just came out with a version 2 of their data. I thought … why not graph the difference between version 1 and version 2 for 2013.